It’s been quite some time since I’ve conducted a Frozen Food Test. I suppose that sometimes a bright idea falls by the wayside in the midst of trying to complete graduate school. Well, as Thesis Madness comes to a head, I figured it would be an opportune time to test a convenience food–hopefully the result would be a palatable and nutritious meal. 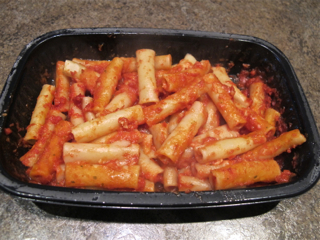 Trader Joe’s has had a pretty solid track record in my previous tests, so off I went to try their baked ziti. The pasta has a surprisingly enjoyable texture; good mouthfeel, and cooked al dente. I was surprised a frozen pasta could reheat so nicely. Chemical free–all of the ingredients listed were actual food! Only 320 calories. 12g protein. Almost no cheese. What’s the point of baked ziti if there is no cheese? Also, if you microwave it, the cheese doesn’t get toasty. Fail. Small serving size. This is more of a snack or side dish than a meal. Not an immense time saver if you cook it in the oven. This was OK. It wasn’t terrible for a microwaved side dish, but serving it as a side means I have to either cook or reheat something else, so I doubt it would save a ton of time (I had mine with leftover grilled chicken). 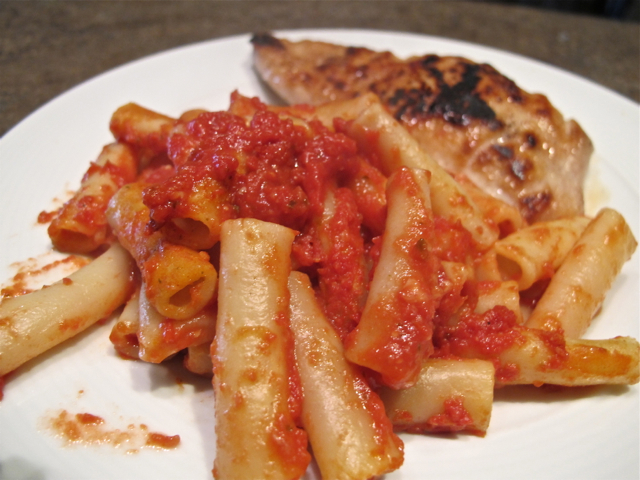 The flavor is decent, but it pales in comparison to my own baked ziti (that’s a link to me cooking the ziti–check it out!). Would I have it again? Doubtful, only because it’s a sin to call something “baked ziti” and not have a layer of golden, melty cheese on top. It’s a good thing cooking is my favorite form of procrastinating.